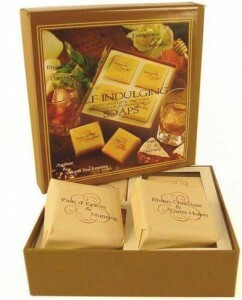 Florence Italy Cashmere Gingerbread Soap – YUM! Just because Christmas has passed, does not mean Gingerbread is gone! Self Indulgence with no guilt and no calories. This beautiful set includes 4 soaps 100 grams each -3.5 oz- with the following evocative fragrances Frangipane Flower & Cashmere Gingerbread & Nutmeg Amber & White Tea Rhum Chocolate and Honey Date. Made in Florence Italy. Details here.